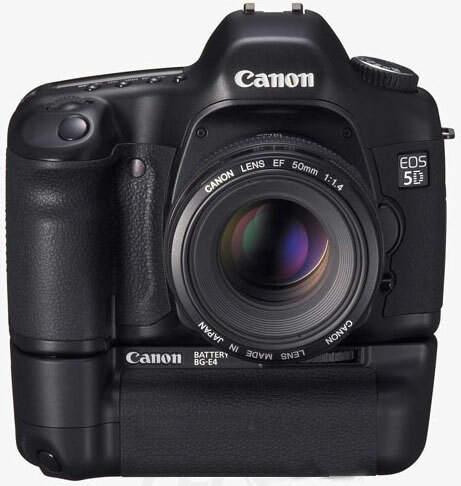 Ok, the Canon 5D. And? There's lots of on-line information and reviews, the two company ones are Canon's main and detail Web pages. You can do a Google search for more and many Website for product and personal review. I'll just add my personal notes here and my initial impressions. I'll add that I bought it with the additional battery pack as seen in the photo. It's not essentially, but can help if you can afford it. I will say if you're an experienced, and especially a professional, photographer, my comments are redundant to you, as you already know with this camera, even if you haven't handled one. It's a well designed camera for ergonomics and features, and the manual is well written to get an understanding of it. In the end it only took about two hours of reading the manual and walking through the features to figure things out and set thing for my initial learning. The camera has a lot of features and does a lot, and I think its criticisms are over-rated or undeserving for the price. It's a full-frame SLR, and while it lacks the weather proofing of the highend models, it's still worth it's price. And I don't have to rethink lenses or image size, which it has a variable image size for faster operation or times you don't need the full size or detail. But you don't have to unthink lenses if you're used to the focal lengths like me. Canon did one thing that makes this camera really nice. All of the basic features you need, such as ISO, white balance for light source, shutter and aperture settings, metering, and EV control are all easily at hand with the right hand and two fingers. You don't have to take your eye from the viewfinder. Then changes requiring the menu is the image quality (file formats) and picture style (color, image type, and b&w). In short, you can set things, and just shoot away. You see the LCD flicker with each shot but for the most part, you can simply keep shooting. The extra battery pack affords you two advantage, long usage without replacing and charging batteries, and vertical controls while holding, they're in the same position in your hand holding the camera so you don't have to wrap your hand around the camera. It's such a camera that once you learn the features you're back to being just what you are, a photographer, except with a few changes, you can change everything with the light, scene and setting. You still have to think and compose. Mistakes are still from not plugging your brain in while shooting.